Chat with a SOTI expert. SOTI ONE is an integrated suite of mobility and IoT solutions. Each solution works on its own to solve today’s toughest mobility challenges. But working together, SOTI ONE tears down mobility silos and connects everything: mobile devices, IoT endpoints, apps and back-office systems. SOTI Assist is the industry’s first Help Desk solution that is ‘purpose-built’ to fix mobile device problems. It incorporates SOTI’s award-winning remote control technology and makes it easy to analyze and resolve mobile device and application issues from anywhere, at any time. SOTI MobiControl makes mobility management easy. It simplifies the security and management of multi-vendor, multi form-factor and multi-operating devices in your multi-purpose business mobility deployment – all through a single, easy to use interface. SOTI Snap is a cross-platform, rapid app development solution for business. It lets organizations build the mobile apps they need faster, cheaper and on time. You don’t need coders, almost anyone can build an app by dragging and dropping only the components they need. SOTI Pocket Controller is an advanced Help Desk solution with remote control functionality. It offers a suite of powerful features including real-time remote control, file/data transfer, registry editing, remote task management, remote scripting, soft/hard device resets and much more. Become an Altitude Partner to take advantage of the unique differentiators of the SOTI ONE platform. Accelerate revenue, grow business mobility, and partner with the fastest growing mobility and IoT management solution on the market. Why do I need Apple device management? Apple hardware is popular in the enterprise because of its elegant esthetic, built-in security and ease of use. Apple iOS devices and macOS laptops are popular BYOD options for enterprise workers, but they are challenging to secure and manage. You need to lockdown your Apple devices to maintain security and compliance while preventing non-productive use. You want to use Apple's enterprise programs (DEP and VPP) for rapid deployment of devices and apps for your business. 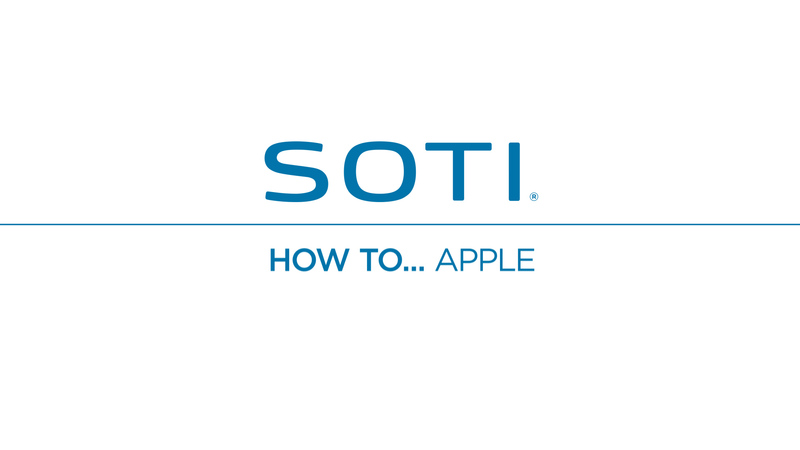 SOTI MobiControl secures and manages all Apple devices — Laptop or mobile, iOS & macOS, COPE, COBO or BYOD. Integrated application and content management features broaden the business mobility capabilities of your Apple devices while maintaining security and protecting valuable company data. Find out why SOTI MobiControl was named PC Magazine's Editors' Choice for the second year in a row. © 1995-2019 SOTI Inc. All Rights Reserved.